1. Put the bait into the compartment end, the smell will spread through the air holes (Note: The holes should face towards the inside of the trap to lure mouse into the trap). 2. When mouse moves to the far side of the fulcrum and trigger the trap, the spring door is closed. 3. The mouse can't get out until you open it up, you can take the rat trap out from your house, remove the compartment and let the mouse out. 1. Put the mousetrap in a place where mice often appear. 2. Please use peanuts, butter or bread as the bait. 3. Please check the trap frequently, otherwise mice may dehydrate to death if left in the trap for a few days. Reusable -- Lightweight and convenient size, easy to set up on the granary, warehouse, home, garden, the wild and anywhere you need. Easy to clean up and put it on next round usage after dried. 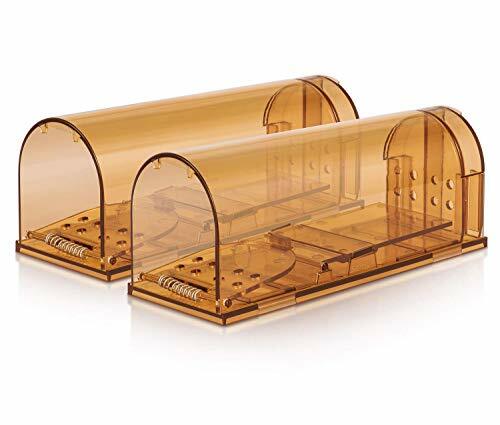 Effective -- Simply put some peanuts, butter or other baits into the traps, the smell will attract the mouse and come into the traps, once the spring activates and the door will close, the mouse has nowhere to go. No Smudge -- No killing animals, no scattered blood and odd odor left, the traps feature in catching the mouse in a humane way, catch the mouse alive while not cause some annoyed stains. Safe to Use -- No glue, no poison, no toxic, no strange smell and irritating chemicals producing in use, catch the mouse alive while prevents some disease, safe to use around the children, pets. Our Warranty -- 24 hours online service and 12 months warranty for refund and replacement, for any problems about item, please email to us, we will sort out your problems promptly. If you have any questions about this product by WeHome, contact us by completing and submitting the form below. If you are looking for a specif part number, please include it with your message.